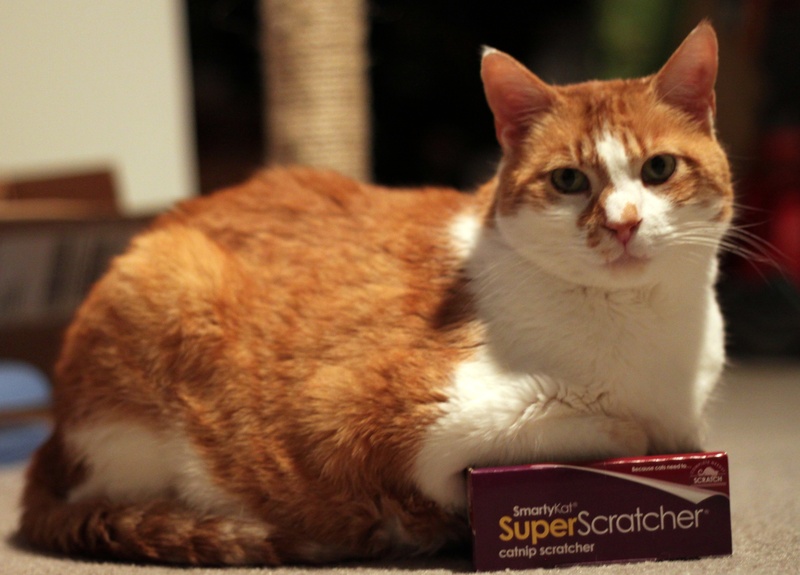 This is our cat Elwyn…we bought this Super Scratcher for him last Christmas so he would STOP scratching our furniture. Yup, not so much. 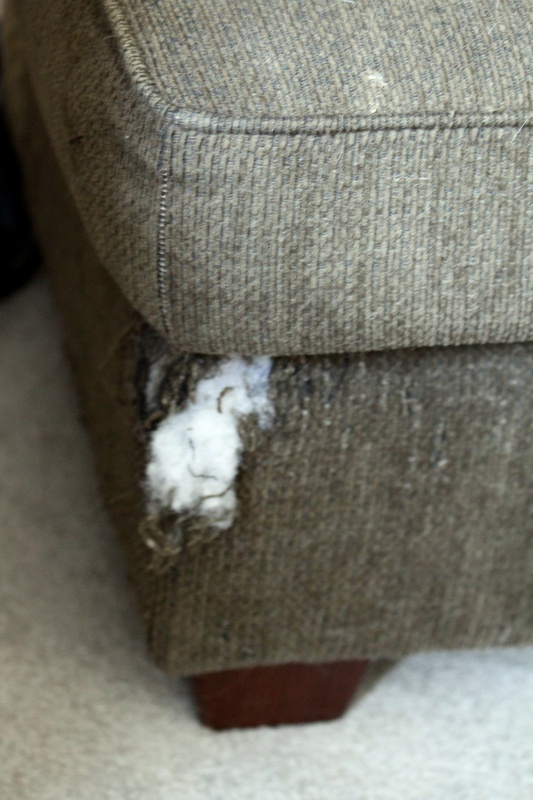 Elwyn seems to (continue to) enjoy scratching our couch and ottoman. It really is probably the #1 thing that annoys me about our cat. He is a great guy…but really come on dude!! He has had this hobby since he came to live with us in 11/08. I like to be crafty when I have time. 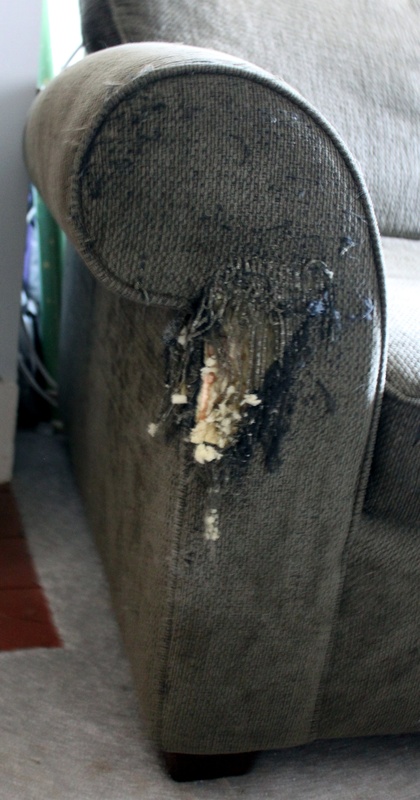 I had a grand idea a few months back finding something to cover up Elwyn’s TLC of our furniture. 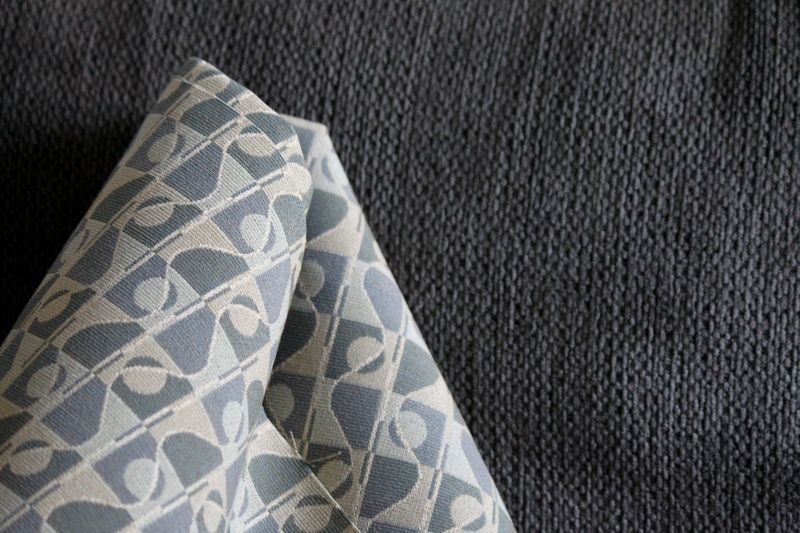 I have been perusing Ocean State Job Lot with their $6 upholstery fabric section, I thought I should be able to find something sometime…here is what I (finally) settled on. 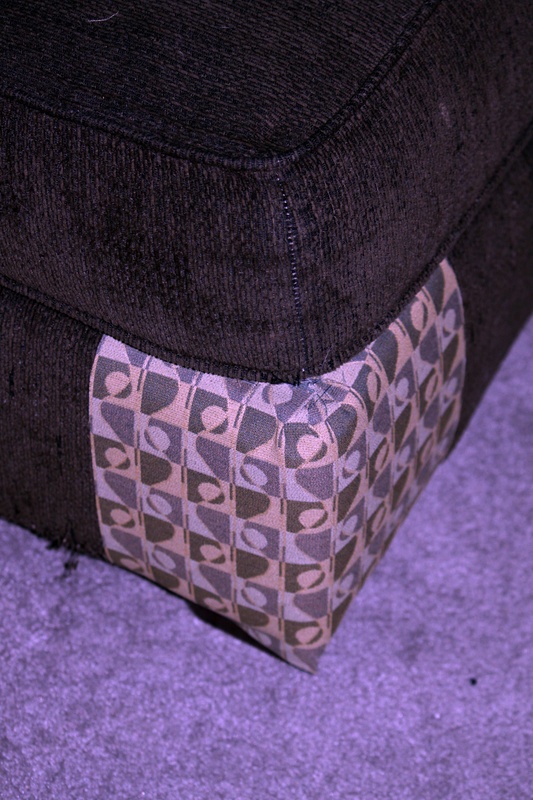 Initially I had the idea of trying to sew this fabric to the ottoman/couch but gave up on this very quickly since I could not get leverage to really sew. I turned to our industrial staple gun. This worked, with some wood under the cushioning but realized I didn’t have enough staples for the project. I made an impromptu trip to Home Depot. 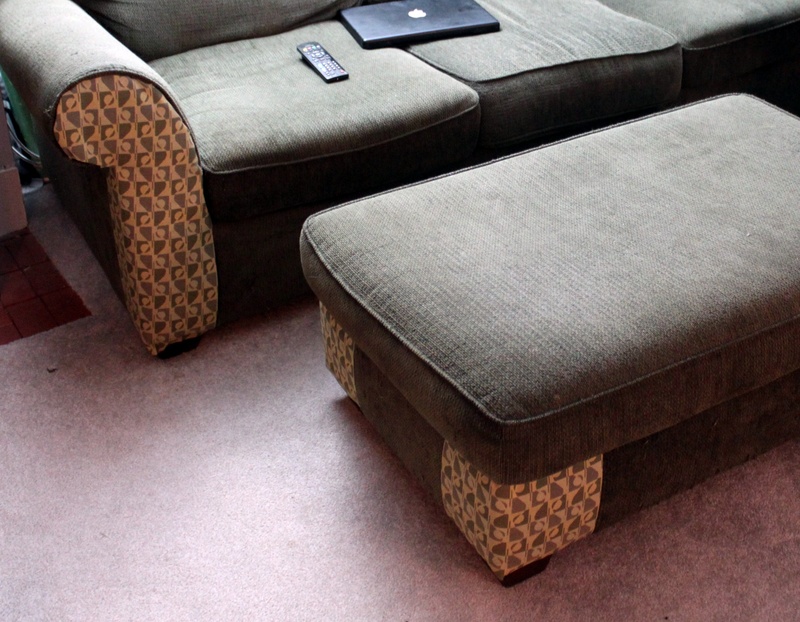 It took a bit to do all 4 corners…but with straight lines and the ottoman being light to move it was pretty simple. 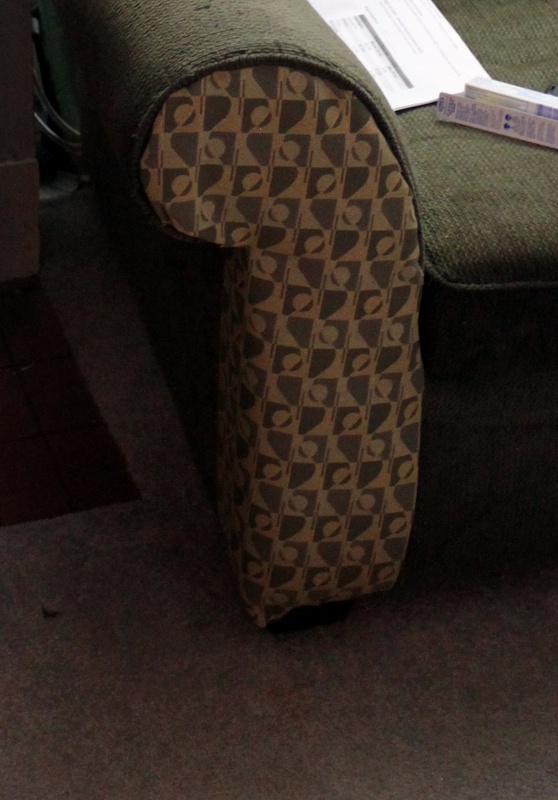 Then the couch…errrr…curves…and I don’t want the staples to show. I used a staple the opposite side and fold down method. This made it tricky since the side of the couch is curved and about 3/4 of the time I stapled it went into the cushion rather than the wood…glad I went and bought 1000+ staples!! All and all, it came out ok. I didn’t come out as flat as I would like, but will suffice for the time being! So, all in all…not too bad…the couch was a bit more challenging and frustrating than the ottoman…but I did it!! YAY!! And just like that, voilà! We’ll see how it goes!! No scratching Elwyn…no scratching!! A number of weeks ago Mike and I visited Bert’s Better Beers and enjoyed a tasting with Moat Mountain Brewing Company. Mike and I decided to take a weekend to visit Moat and enjoy the North Conway side of the White Mountains. All too often we head straight north on Route 93. In our research we came to find out that Moat Mountain Brewing Company also has a Smokehouse/Restaurant and Inn…it was exactly what we were looking for in a weekend away! Here are some pictures from our trip (in no particular order)! !